The first was for $25 billion. The second was for $17 billion. And now, as predicted, GM and Chrysler (cash-conduits for the UAW) are back for more. The only surprise is that they managed to squeeze the third one into 2008. GMAC might not be the end of it for auto financiers and manufacturers: Within a couple days, a Treasury official says, the agency will post guidelines for loans to auto companies generally. No word yet on how broad eligibility might be. In another curious twist, the GMAC bailout appears to include a loan to let General Motors increase its stake in GMAC — even as Federal Reserve banking rules appear to require it to shed ownership. Of the $6 billion announced tonight, $5 billion goes to purchase preferred shares in GMAC (with an 8% coupon for the government, a nice bump up from the 5% banks are paying). But the remainder, of up to $1 billion, is a loan to General Motors — a loan that allows GM to participate in a rights offering from GMAC. That rights offering, of course, is being presented as part of a make-or-break strategy by GMAC to refashion itself into a bank holding company and avoid bankruptcy. The Federal Reserve approved GMAC’s application to become a bank holding company on Christmas Eve — but GM, and co-owner Cerberus, has to give up control of of the lender to comply with bank ownership rules. You won’t buy the products the UAW builds… so they’ll be taking your money anyway. Indeed, it was Reuther’s UAW that established the dÃ©tente between organized labor and capitalists that engendered — or at least facilitated — the unprecedented post-war gains in both productivity and household income. By settling the 1950 Big Three contract, which became known as the “Treaty of Detroit,” the UAW exacted gains for its members that allowed them to move firmly into a new middle class, with retirement and health security as the cornerstones of the new prosperity. In exchange, big business obtained a sense of relief, as the Treaty of Detroit represented a new, thoroughly American unionist approach to collective bargaining that eschewed the Marxist demand for ownership of the means of production. The right wing extremists who would begin their takeover of the Republican Party twenty years later excoriated the deal as creeping socialism, and Communists pilloried Reuther and the UAW as capitalist lackeys and sellouts. But as the radicals fumed, the nation prospered, and the hardworking men and women of the UAW — and subsequently, the rest of blue-collar America, both union and non-union — reaped the benefits of a mature labor peace that saw workers get their piece of the capitalist pie. My initial reaction on reading this was to title a post, “UAW: Actually stupid.” By that logic, I thought, much of the venture capital industry is in the hands of rapacious Marxists who provide services in exchange for stock (that is, ownership of the means of production). They were waiting for the Bush bailout. If the UAW had negotiated contracts in the 1950s, 1960s, and 1970s that had enabled it to slowly take a pivotal capital stake in the company, the UAW would eventually face a point where the interest of workers and shareholders were entangled. This would be great for workers, because from work rules to health care benefits, whether a service was provided to an employee by the United Auto Workers or General Motors would be only an academic distinction. The problem with this is that as employees would be receiving benefits from the company at both ends (as stockholders and employees), trade-offs would have to be faced. The UAW would be responsible for its own future. Instead, the UAW decided to take an adversarial view against the Detroit 3. The UAW attempted to bleed the owners of the company dry through crazy contracts and even crazier strikes. Because the UAW did not own GM, it did not have to worry about the pain this caused stockholders. Even better, the UAW assumed that if GM went bankrupt, now investors would be found to wipe out the old ones. In 2008, this new investor was George Bush. In 2009, it may be Barack Obama. The UAW strategy over the past two or three generations have assumed that if ever things got really bad, the taxpayer would subsidize their contracts. Under George Bush, their assumption has proved right. Let’s hope that in 2009, Barack Obama proves them wrong. Bush bails out unions: Will Obama invest in the future? Sports Utility Vehicles are trucks. They are heavier than cars. They exist under a different fuel economy standard because it is senseless to inflict the same gallons-per-mile criteria on a vehicle designed to carry heavy loads or cross rivers as a car used for transportation. Senselessly, SUVs do not require a truck drivers license, leading people to use them as luxury vehicles, and making violations of the rules of the road much more likely to end in death. Even though our current President chose bailing out unions and electric vehicles, startups, solar power, and building electric vehicles that would revolutionize logistics in the army, we get the same GM+UAW team that has hurt us so much. Hopefully President-Elect Obama will be brave enough to stand up to ignorant and misguided environmentalists, and continue to support both ethanol, biodiesel, and other alternatives to gasoline. While oil continues to be low, Barack Obama has the benefits of weakened states like Russia and the challenge of keeping the innovation going. Let’s hope he is up to the job. I don’t doubt that the UAW bailout is good party politics; it forces then-President Obama (a Democrat) to decide between continuing yet another unpopular Bush policy or throwing yet more loyal supporters under the bus. It’s just bad for America. The White House announced a $17.4 billion rescue package for the troubled Detroit auto makers that allows them to avoid bankruptcy and leaves many of the big decisions for the incoming Obama administration. In a statement, President George W. Bush said the administration decided against forcing a bankruptcy to compel cost-cutting, in order to avoid the risk that consumers would desert one or more of the companies and touch off an industry collapse, deepening the current economic downturn. The economy is hurt, as unions and large companies learn if things get really bad, they can depend on the government (as long as they spend a fortune on lobbyists and unions: Enron, Arthur Anderson, Lehman Brothers, et al. were not so wise). Auto innovation is hurt, as dinosaurs continue to take funding and investment that could go to innovative start-ups instead. Our infrastructure is hurt, as we continue to pour money into the past. The American taxpayer is hurt, as some of this money will be turned around to lobby us for even more. Rumors are swirling that President Bush may use Bush-Pelosi Bailout funds to save the UAW, General Motors, and Chrysler. Bush may give funds to the Detroit bailout on the condition that Congress not refuse $350 billion more for Wall Street. Detroit is in trouble because of its coddling of its unions, its incompetent management, its short-sighted use of government connections, and its love of debt. Yesterday the House of Representatives passed the UAW Bailout, setting up the new subsidies for General Motors and Cerberus Capital Management to be the second Bush-Pelosi bailout. As the line goes, you won’ by their cars, so they’ll take your money anyway (h/t Boing Boing, The Beast, and Smart PEI. There are two lines of argument I have read for the UAW Bailout. One is essentially Keynesian, and argues in these bad economic times, buildnig a giant pit and hiding money in it would be a good move, so building cars no one wants is no worse. There’s some truth in this. The other line of argument is that Detroit is the ‘backbone of our economy,’ ‘the American Dream is an American car,’ etc. This is an argument-from-nostalgia, and as such relies on the biases of those who remember their childhood but no one else’s. Thus, we should subsidize Detroit because it was a big-deal in the lives of suburban children of the 1950s, but not national light rail, because that was someone else’s childhood. This attempt to recreate the Eisenhower years by recreating the Eisenhower economy is stuck in the past. To drive to the future, Detroit needs to fail. 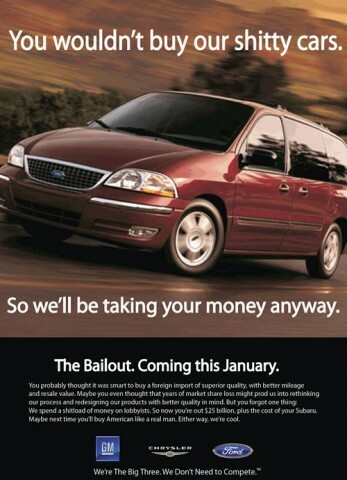 Courtesy of Economist’s View, David Leonhart’s article in the New York Times on the possible UAW bailout. David discusses the high costs of labor paid for by the Detroit 3, and seems to be arguing in general that it’s a good idea for the country to subsidize the lifestyle of Michigan democrats. The calculations show, accurately enough, that for every hour a unionized worker puts in, one of the Big Three really does spend about $73 on compensation. So the number isnâ€™t made up. But it is the combination of three very different categories. The second category is fringe benefits, like health insurance and pensions. These benefits have real value, even if they donâ€™t show up on a weekly paycheck. At the Big Three, the benefits amount to $15 an hour or so. Add the two together, and you get the true hourly compensation of Detroitâ€™s unionized work force: roughly $55 an hour. Itâ€™s a little more than twice as much as the typical American worker makes, benefits included. The more relevant comparison, though, is probably to Hondaâ€™s or Toyotaâ€™s (nonunionized) workers. They make in the neighborhood of $45 an hour, and most of the gap stems from their less generous benefits. The third category is the cost of benefits for retirees. These are essentially fixed costs that have no relation to how many vehicles the companies make. But they are a real cost, so the companies add them into the mix â€” dividing those costs by the total hours of the current work force, to get a figure of $15 or so â€” and end up at roughly $70 an hour. The crucial point, though, is this $15 isnâ€™t mainly a reflection of how generous the retiree benefits are. Itâ€™s a reflection of how many retirees there are. The Big Three built up a huge pool of retirees long before Honda and Toyota opened plants in this country. Youâ€™d never know this by looking at the graphic behind Wolf Blitzer on CNN last week, contrasting the â€œ$73/hourâ€ pay of Detroitâ€™s workers with the â€œup to $48/hourâ€ pay of workers at the Japanese companies. These retirees make up arguably Detroitâ€™s best case for a bailout. The Big Three and the U.A.W. had the bad luck of helping to create the middle class in a country where individual companies â€” as opposed to all of society â€” must shoulder much of the burden of paying for retirement. Of course, this is absurd. Not every industry was, and is, unionized to the extent that the Detroit 3 are. Not all of them have these level of benefits for retired workers. Rather, the Big 3 wanted political favors (such as bailouts and protection from competition) and spending future income on future workers seemed like a good trade to them. GM, Chrysler, and Ford are failing in part because of their foolish attempts to manipulate the government into protecting them from the market. General Motors, the stock of the future! A Boston correspondent writes: Bethlehem Steel’s amazing market rise has been eclipsed. This week General Motors stock sold at $697 per share, the highest price at which any stock ever has sold on the New York Stock Exchange, with the exception of Northern Pacific. The latter issue sold on one occasion at the record price of $1,000 per share, but this was a forced price during the corner of 1901. The record high price for a stock on the Boston market is held by Calumet and Hecla, which brought $1,000 per share in 1907. The stock market career of General Motors stock has been spectacular in the extreme, surpassing even the rise of Bethlehem Steel. In 1913-14 it sold as low as $25 per share; for many months after the market soared as a result of munition and motor orders, it lagged behind other issues of its class. Even in 1915 it sold for only $82 per share. Then it began to advance under steady buying, and its low point for the present year never went below $405. The advance on September 12th last was an experience to which even old-time traders were unused. The stock rose $52 for the day. Just by way of comparison, Bethlehem Steel, hitherto the premier war stock, gained 24Â½ points the same day, to 524Â½, a new high record. Next day General Motors rose $55 per share, to $697, making a gain of $107 for two days, and Bethlehem Steel gained $30Â¾, to $555, per share, a rise of $55Â¼ for the two days. The General Motors Company has under way a recapitalisation plan that calls for a 400 per cent stock dividend on the common, equivalent to five shares of non-par value stock for each share of the present capital stock. The United Auto Workers took on a strong semblance of the union of the future last week when it agreed to a contract for the new General Motors Corporation Saturn plant, where GM will try to build small cars at a profit. The UAW agreed to a drastic reduction in the number of job classifications at the plant, allowing each worker to perform several tasks. And once the plant is in full production, the workers will make just 80 percent of the industry wage — with the gap potentially filled by pay based on such things as profit at the plant and product quality. In return, the workers will have a voice in making decisions from the shop floor on up and an unheard-of measure of job security. The initial Saturn employees will be guaranteed jobs for a lifetime; 80 percent of those hired subsequently will get that guarantee. GM is a company whose best days may have been 90 years ago. 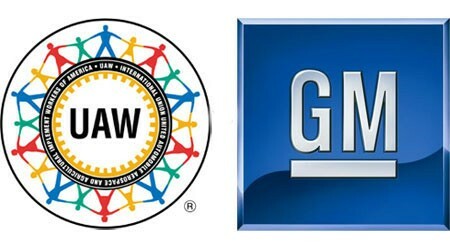 GM and her union have been talking about wrenching changes for a generation. Nothing comes of it. The bad actors (shareholders and unionists) are rewarded, against and again, by the federal government in the form of bailouts, protectionism, and hidden subsidies. The Smoot-Hawley Tarrif Act was a bill designed to prevent American jobs from going overseas, that helped turn the Great Recession into the Great Depression. It created a “beggar-thy-neighbor” policy, as every country tried to limit the damage by restricting even more trade. The global economy went into a death spiral. Yet so far, there is no talk of offering aid to Toyota, Honda, BMW or the other foreign automakers that have built factories on American soil, employed American workers and managed to make a profit doing so. â€œIf Japan was doing this, weâ€™d be threatening billions of dollars in retaliation,â€ said Jeffrey Garten, a professor at the Yale School of Management, who as under secretary of commerce in the 1990s was one of many government officials who tried in vain to get Detroit prepared for a world of international competition. â€œIn fact, when they did something a lot more subtle, we threatened exactly that,â€ referring to calls for import restrictions. A Detroit bailout will expand protectionism and limit research and development work in the United States. Saving shareholders and union men from their own mistake is not worth damage to the global economy. And if the Detroit Bailout passes, and we damage the global economy, what is our reward? Yet Another Detroit Bailout. Update: If we begin a subsidy trade war, Germany is preparing to respond. Hat-tip to Economist’s View. 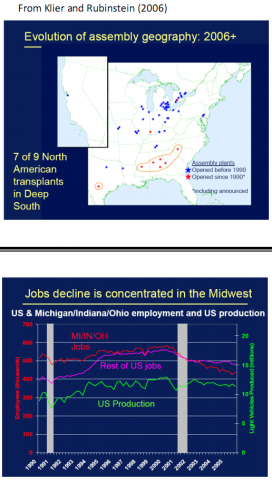 The presentation reminds me of a similar one on the decline of ag in the upper midwest, and the change-of-scale that region is undergoing. Throughout much of the midwest, you can take the historic population, divide it by 10, and you get the new sustainable population.